I'm a 17-year old highschool junior in Ridgewood New York. opposed points to enable differential steering in navigation. to robot learning and adaptation. 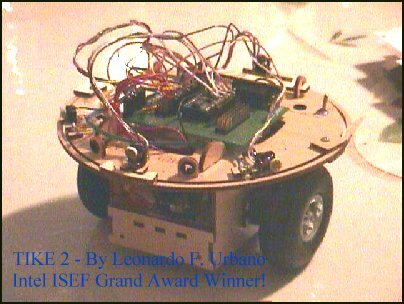 TIKE 2 is a continuation from a past robot project called TIKE. function contribute to the robots overall adaptive behavior. and neat connectors. This really backfired when debugging. know how fun it is to get mail from fellow hobby-roboticists.